We’ve all seen “click bait” lists on websites, tempting us with something like this: “You’ll be utterly amazed by these 25 unbelievable facts that you definitely don’t know; number 18 will make your jaw drop to the floor.” If we take the bait for such a list, we’re usually disappointed. There are also lists that are well-researched and thoughtfully organized by a subject matter expert. 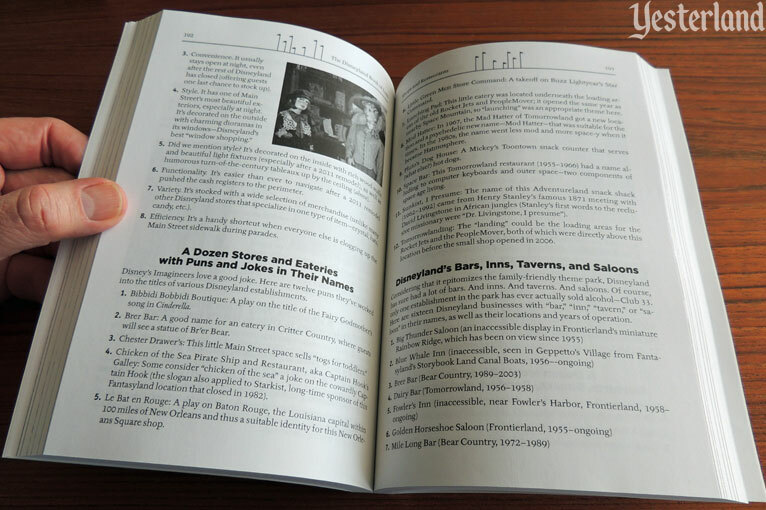 Lists can provide a fun and succinct way to present related facts, opinions, and trivia. Lists can bring together seemingly unrelated items. 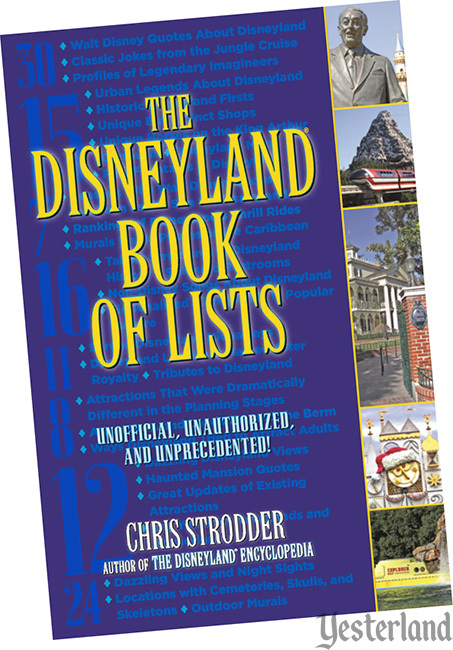 You’ll find the latter in The Disneyland Book of Lists by Chris Strodder, author of The Disneyland Encyclopedia (Yesterland book review here). 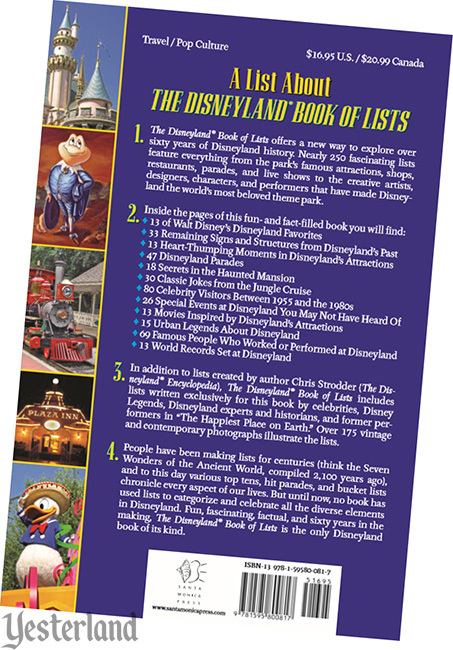 This volume of lists promises “a new way to explore over 60 years of Disneyland history”—and it delivers on that promise. If this subject interests you and you take the bait, you will not be disappointed. Strodder clearly loves Disneyland and popular culture. 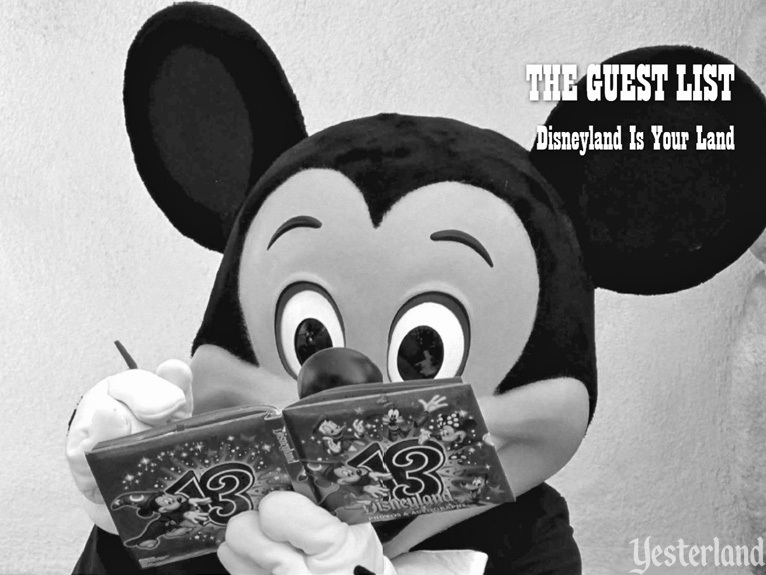 His 247 lists about Disneyland are original and often witty. Allow me to present the rest of this book review as a series of lists. 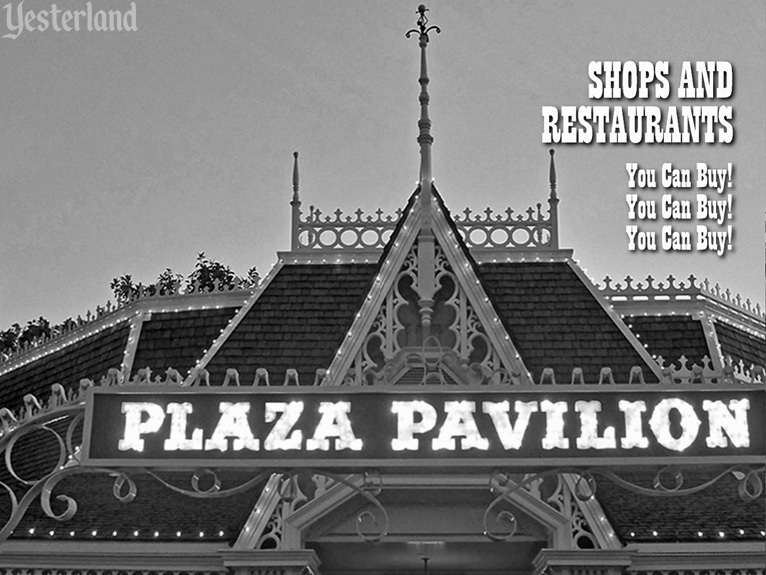 Shops and Restaurants – You Can Buy! You Can Buy! You Can Buy! 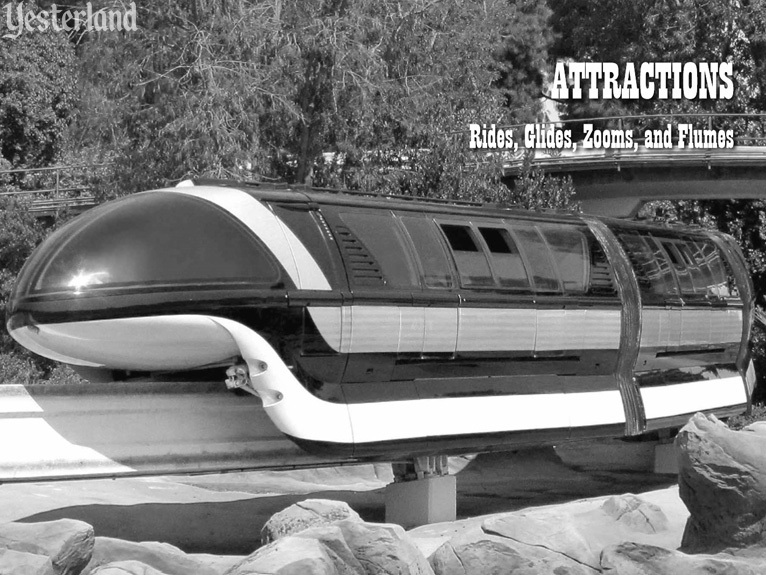 Page 326, in a list of “A Dozen Experts on Disneyland,” where each of us was invited to answer the same five questions. Page 346, in “A List of people for Whom the Author is Thankful,” where Strodder thanks everyone who contributed to the above list (along with other acknowledgments). Beyond answering five questions, I had no role in the creation of the book. Reading it cover-to-cover like a regular nonfiction book. Randomly opening the book and reading a few pages, never knowing if you’ll get a repeat or something new. Reading a few lists at a time in the bathroom, when this provides just the right amount of entertainment. When I first received the book, I randomly opened it to a list of 14 owls throughout Disneyland. If you’ve visited Disneyland several times, you’ve probably seen most of them without ever making the connection that Disneyland has so many owls in so many roles. Owls hunt mice, right? 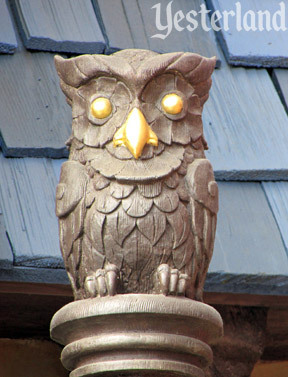 But in the park where Mickey and Minnie live, owls have stood in almost every land. In front of Many Adventures of Winnie the Pooh, Owl’s house is mounted to a tree; Owl himself appears forty-five seconds into the attraction and again in the final party scene (“Owl” is also the name of one of the ride’s vehicles). The Owl character is one of the pins in the seven-piece Winnie the Pooh set sold at Pooh Corner. 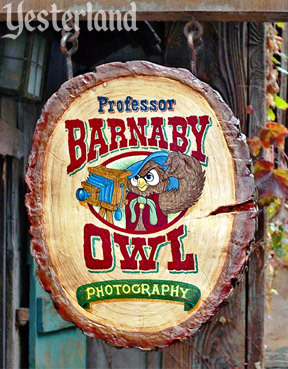 Professor Barnaby Owl runs his Photographic Art Studio near Splash Mountain’s exit (above). Two owls stand inside Splash Mountain, one on the left of the second upwards hill and another above and to the left near the end. 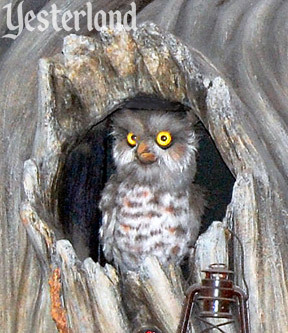 In Alice in Wonderland, an owl watches Alice early in the attraction. A big owl is part of the display behind the Enchanted Chamber’s counter. A golden-eyed owl observes from a post at Fantasy Faire (above). An owl holds the “Beware!” sign at the start of Snow White’s Scary Adventure. Owls also decorate the interiors and backs of the mine carts. Hooting owls are among the recorded bird sounds heard along the Big Thunder Trail. An owl is perched in the main tree inside the Frontierland Shooting Exposition (above). 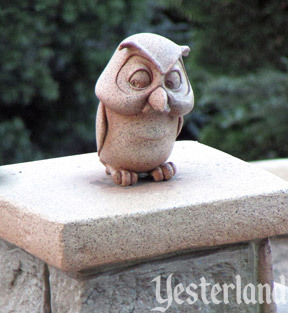 Two small owl statues stand in front of Sleeping Beauty Castle (one on either side of the main walkway) (above). Displays during the Halloween season have featured owls—for instance, 2014 brought owls to a Disney Clothiers, Ltd. window and Disney Showcase wall displays. An owl named Ollie was one of the main characters in America Sings (1975–1988). Beginning in 1973, an Audio-Animatronic owl narrated a pre-show presentation at the Walt Disney Story inside the Opera House. Disclosure per FTC guidelines: Werner Weiss received a review copy of The Disneyland Book of Lists. Mr. Weiss does not receive any financial consideration from Chris Strodder or Santa Monica Press. Yesterland is a participant in the Amazon Services LLC Associates Program, an affiliate advertising program designed to provide a means for sites to earn advertising fees by advertising and linking to Amazon.com.